Our 3D Waterjet cutting services gives a trend of avoiding costly materials and using them to the best of your knowledge. No more loss because with water jet cutting, minimum waste will be generated. Water jet cutting gives you the ability to cut multiple pieces from an individual piece of material. Whether the pieces that are the same or different parts, if they require being made from the same substance, the same density, etc, then nesting offers the ability of accurately using the whole available sheet of material and in return, minimum waste is produced. 3d Water jet cutting Services is a cutting process where water is used for cutting material. The pump is pressurized with water (3800 bar) and passed through a fine nozzle. It forms a very strong, even-pressure water jet (100 m / s), which allows you to cut various materials: rubber, plywood, plastics, leather, floor coverings. Stronger and harder materials such as titanium, hardened steel, stainless steel, aluminum, glass, marble, ceramic tiles, granite, polystyrene, abrasive particles are added to water jets for cutting. Using a cutting machine with CNC control it is possible to cut parts with very complex shape. Therefore, it is possible to exclude subsequent milling, drilling and milling operations. With water it is possible to cut almost all materials, without causing thermal or chemical changes in the material. When cutting the water, the materials do not heat up, so they do not burn and thus no harmful gas is generated on the environment. The details are not deformed and no smooth surfaces are damaged. The diameter of the cutting blade for various materials is: 0.1 to 1.5 mm, which provides significant material savings. The benefits of the method The benefits of water treatment to other cutting technologies include: more environmentally friendly cutting methods; cuts a lot of non-metallic materials, including flammable materials; does not cause thermal and chemical changes in materials; material loss is minimal; precision; the cheapest and fastest way to cut intricate details; good surface quality, does not require later post-treatment; allows you to cut materials up to 100 mm thick. Water treatment is suitable for the manufacture of medical and food industry equipment and for the manufacture of glass, ceramics, marble, plastics, rubber, wood and paper products. The amazing thing about Water jet cutting Services is the ability to cut complex shapes, tight angles, sharp corners and script lettering. Thus, it solves many problems previously encountered in manufacturing when using conventional tools. Instead of making one item at a time, the Triangle unit can cut many items together to exacting specifications. Thickness of materials can range from 0.005 inch up to 4 inches with a potential computer controlled tolerance of 0.010 inch. Water jet Cutting services is dust-free, heat-free and does not generate any toxic elements. It, therefore, gives you high efficiency, eliminates a lot of heretofore wasted material and consequentially gives you higher profits. Low operating temperatures avoid melting, distortion and heat-affected zones created by the laser and plasma arc systems. 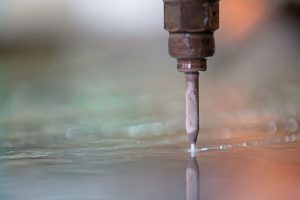 Thus, there is no need for expensive grinding, annealing or secondary machining of heat-affected surfaces to obtain final dimensions.The Water jet cutting Services with little lateral or vertical force and is virtually vibration free. This minimizes the mechanical stress at the material edge and eliminates the need for costly part-support fixtures. Abrasive watejets cut in any direction and are highly maneuverable and excellent for cutting precise right angles and complex shapes because the cutting head does not contact the work piece. In more conventional methods, cutting path is restricted by blade or tool geometry. The 0.030 inch to 0.060 inch thick abrasive stream minimizes width of cut or kerf, which maximizes material use. Abrasive Waterjets cut small holes, narrow slots and closely spaced patterns. Small parts can be nested within larger ones. Unlike a saw rough cut, which leaves material that must subsequently be machined, an Abrasive Waterjet cutting often requires only a single pass to produce final dimensions and finish. Abrasive Water jet cutting Services is often faster than traditional methods, depending upon material, thickness and required edge quality.